The DB200 will alert you to someone at your door or your phone ringing. This dual purpose DB200 will make your life easier. Are you looking for a dual purpose doorbell and telephone signaler? The DB200 is unique because it produces zero false alarms and is not triggered by sound. It chiefly works as a wireless doorbell signaler. 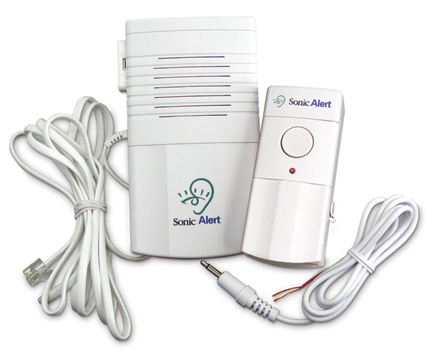 This wireless doorbell signaler alerts you to someone being at your door by flashing a light that is plugged into the base unit or different Sonic Alert receivers anywhere within your household. It also is a telephone signaler too. You just have to plug the telephone signaler into a modular telephone jack. The low equivalent number does not gain any phone line power. This product works with the following remote receivers: SA101, SA201, BL300, RH100, and the remote receivers of the SB1000 alarm clock. This product can do multiple things. It solves two purposes for the customer. In the end, it works perfectly to alert you to multiple signals that you need to keep tabs on.